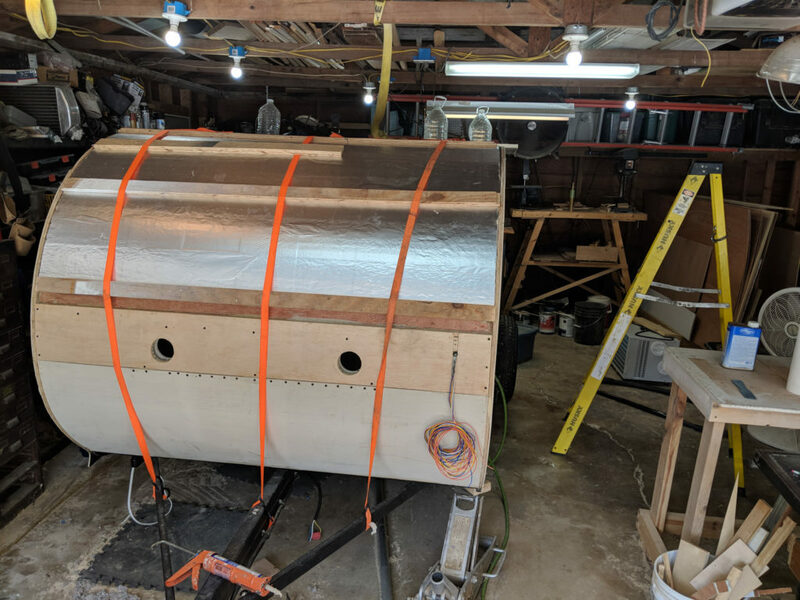 The long term plan is to skin the teardrop in aluminum. 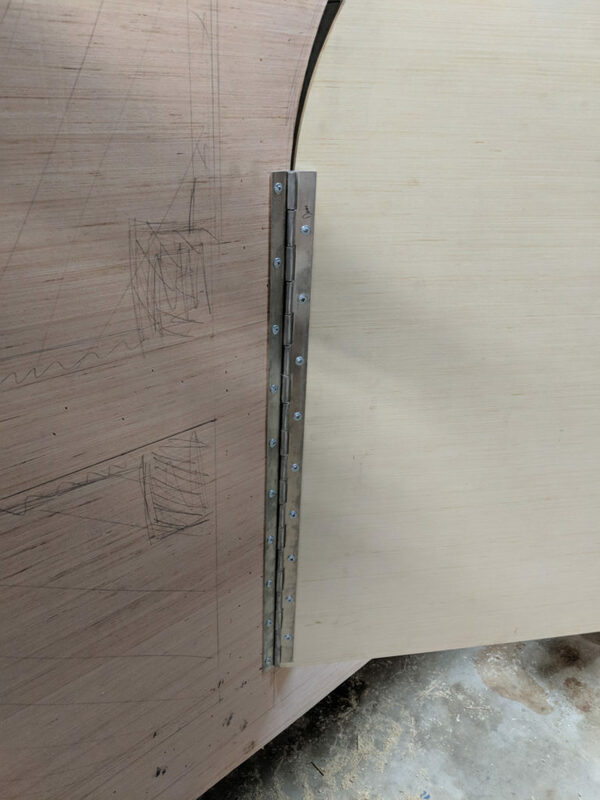 That aluminum will sit on top of a base of plywood. This last couple of weeks have been about getting the skin on. It is finally time to put on the exterior sub-skin. We plan on adding a layer of polished aluminum on the outside as the real outside skin, but it needs a solid base to sit on. Initially I squirted the glue out and just smashed the siding into it. When I moved to the second side I realized that was dumb. I took a plastic scraper and notched it on the table saw to make a notched trowel. With it I got a much more event application of the glue. 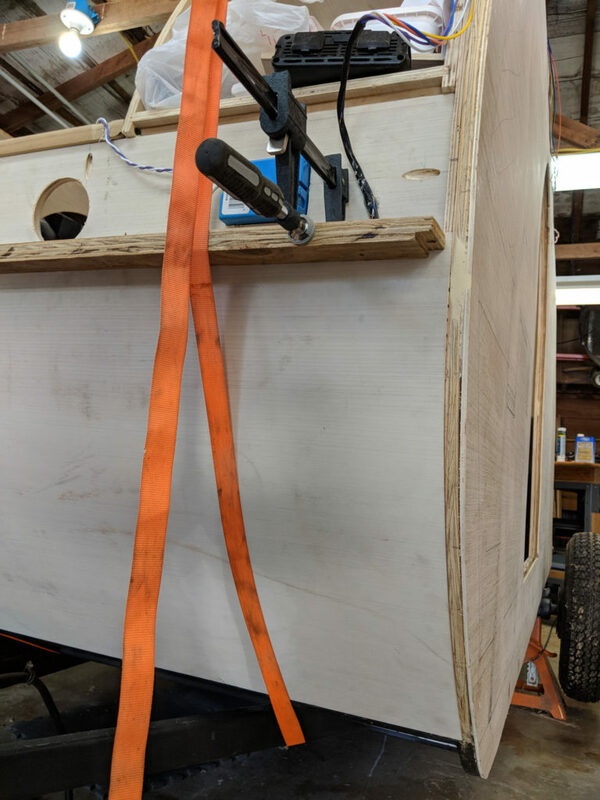 The process of attaching the sides was limited by clamps. Even though most of the surface area had to be held with nails, I wanted to make sure the edges had really good adhesion. That means all the clamps I own edge to edge. 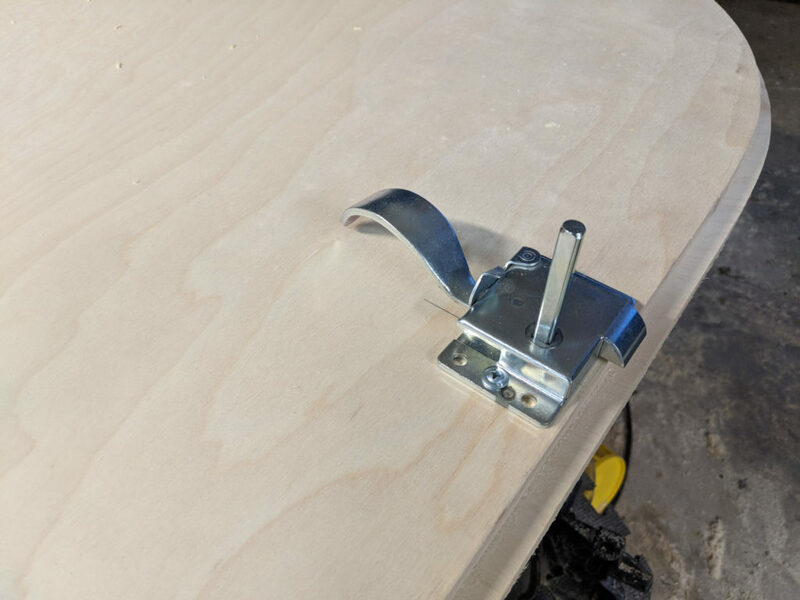 Like the DIY notched trowel, I realized that adding a backing board made the clamps more effective by spreading their force more evenly. Independent of the side walls I started to work on the lower front. 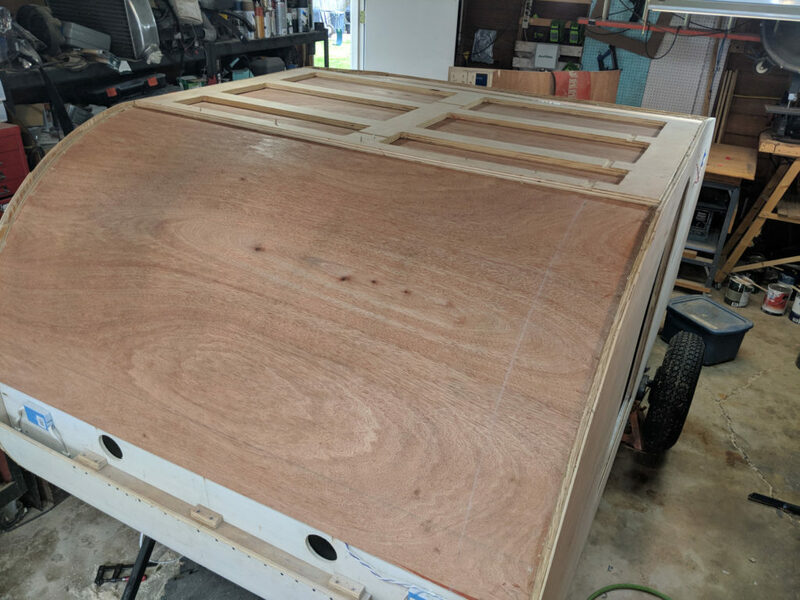 Because this is potentially an impact areas (road debris, rocks, etc) I wanted it to be heavier than the 1/8″ ply I’m using for the rest of the roof. I score cut a piece of 1/2″ ply every 1/2″ inch to a depth of about 3/8″. This left me a flexible sheet of ply. With a little coaxing, some more construction adhesive, webbing straps and clamps (not to mention brad nails) I permanently installed this piece. Down the road, I plan on covering this with something heavier duty (diamond plate aluminum?) than the rest of the trailer, and also making it replaceable should it be hit by something and damaged. 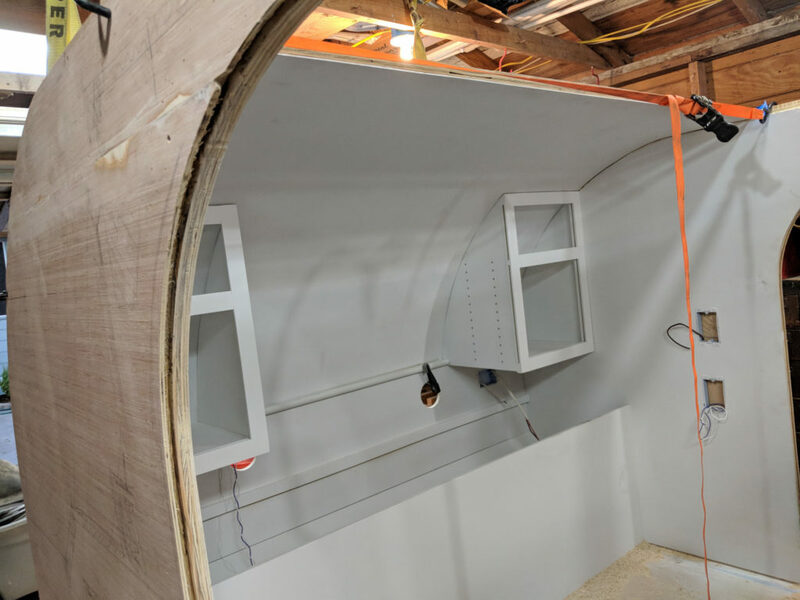 Before I could install the exterior roof, I had to install the interior ceiling. It is 1/8″ ply that sides in a rabbet. Before the installed I primed them (save a 1/2″ edge where the glue will hit). Structural pieces of plywood sit across it to give it strength at intervals. After test fit, it was time to glue them down. 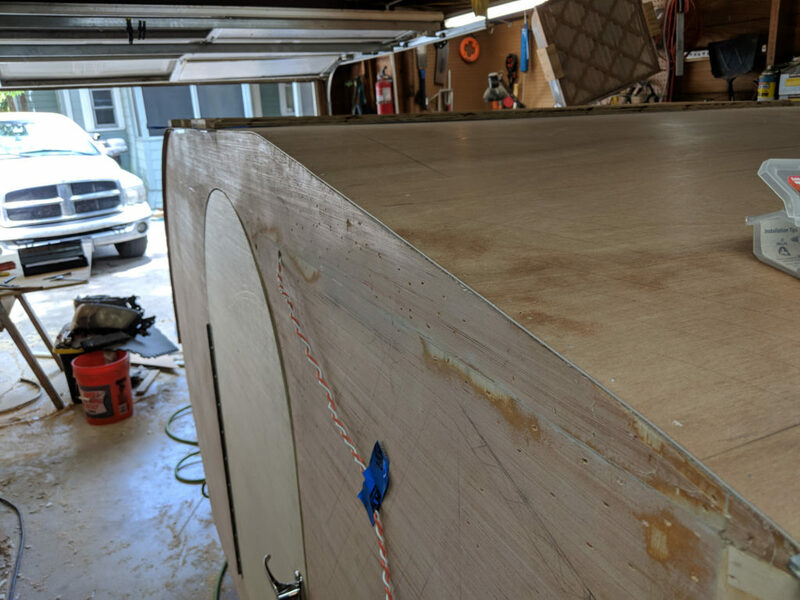 This 1/8″ ply is very flexible which is why I’m using it. Unfortunately, it is so thin that any mechanical fastener goes right through it or pulls out. 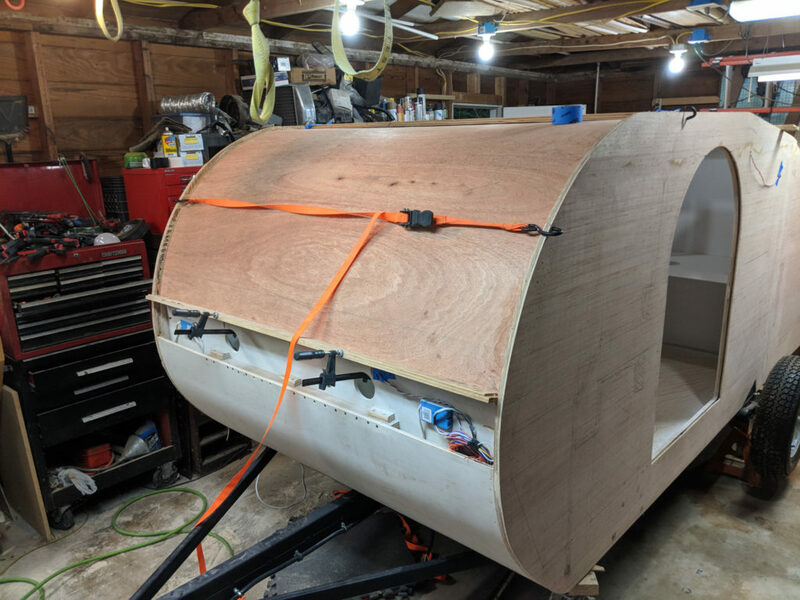 Attaching it to the trailer was a little problematic over this curve. Luckily I have about 15 minutes of open time with the construction adhesive I’m using so I could reset and adjust as needed. It didn’t go in perfect, but once the initial glue up dried I was able to reinforce the weak areas. The construction adhesive is structural when cured. For the flat top portion of the roof I wanted something stronger than simple straight runners. Down the road I might want to attach solar panels to the roof, add a roof rack or a moon roof. 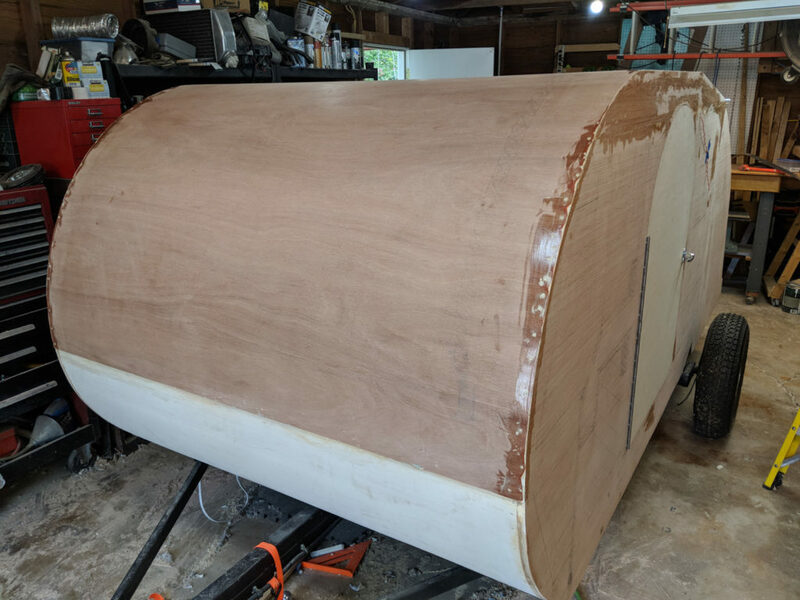 I took a 3′ x 63″ section of 3/4 sanded plywood and cut openings in it to lighten it. I have a wide 3″ margin along the edge I can screw into later if I need to as well as a central 3″ section. 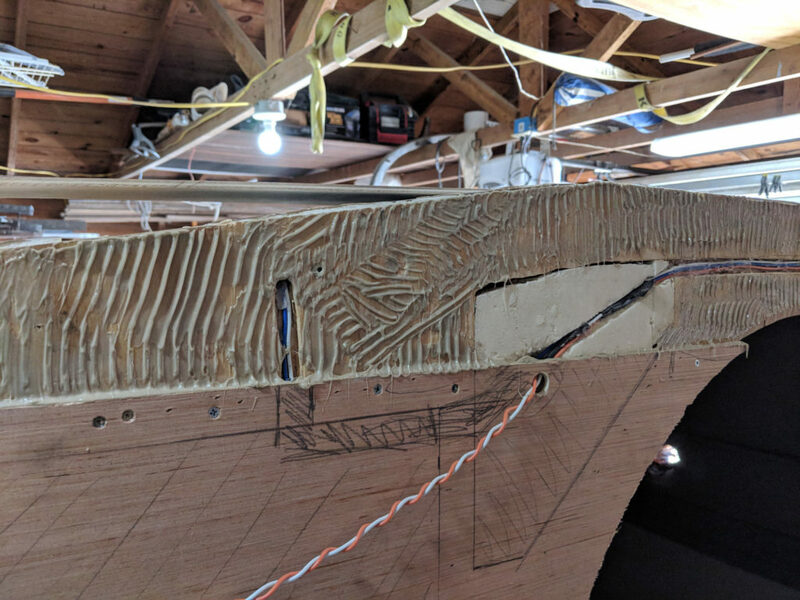 The entire piece was set on top of more 1/8″ plywood. It was glued to the side wall and ceiling with yet more constructions adhesive. 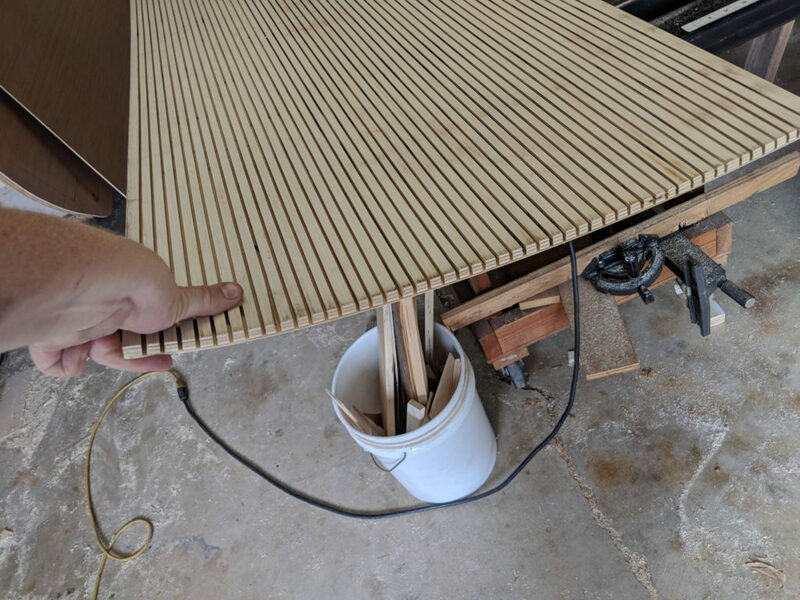 During the glue up I used scraps of plywood and screws to make sure the ceiling was pressed hard against the 3/4″ support. I also made sure to space the opening so that the seam between the front ceiling and mid ceiling fell on a cross member for strength. The joint between the center ceiling piece and the rear ceiling piece falls over the top of the rear cabinets and is supported from below. With the ceiling in, it is time to turn to insulating the gap between the ceiling and the roof. The gap is 3/4″ inch and I’m using polyisocyanurate insulation just like I did in the wall voids. 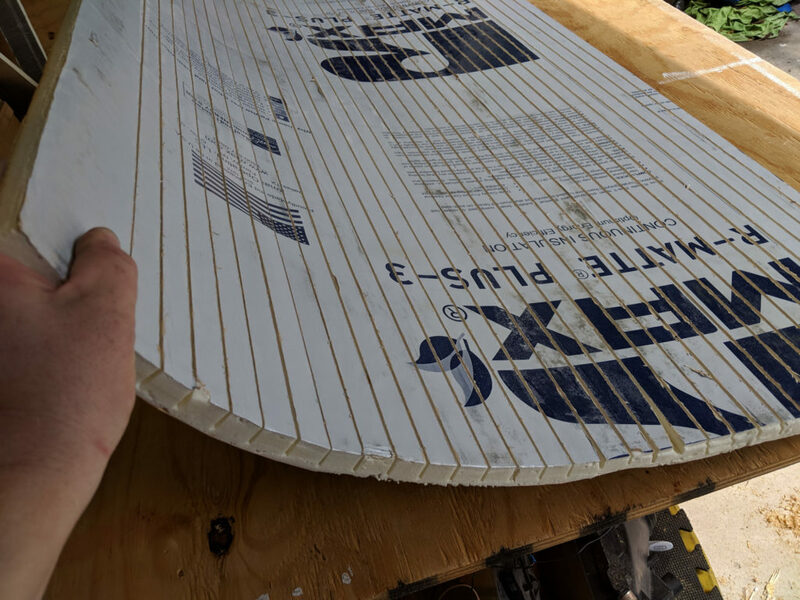 To curve the insulation, I used the same technique I used on the plywood except with 1″ spacing of the score cuts. 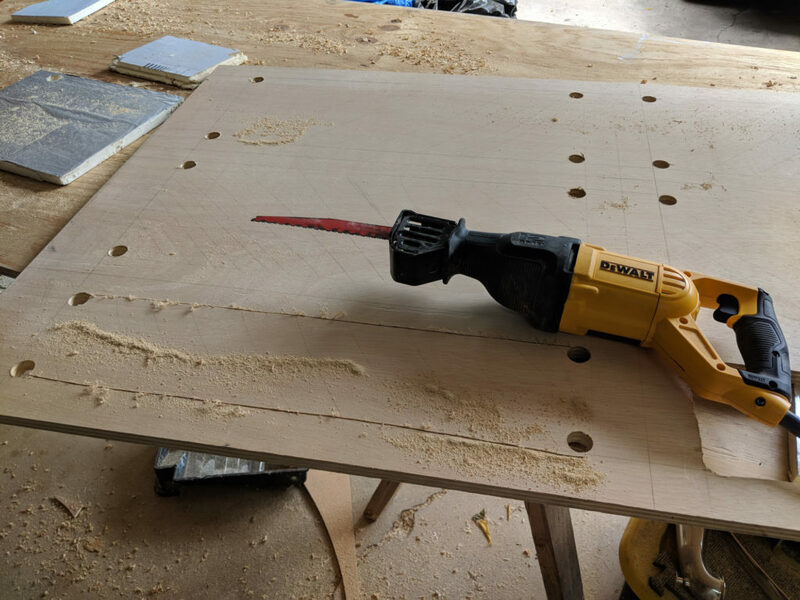 The foam cuts on the table saw, but wear a breather mask! 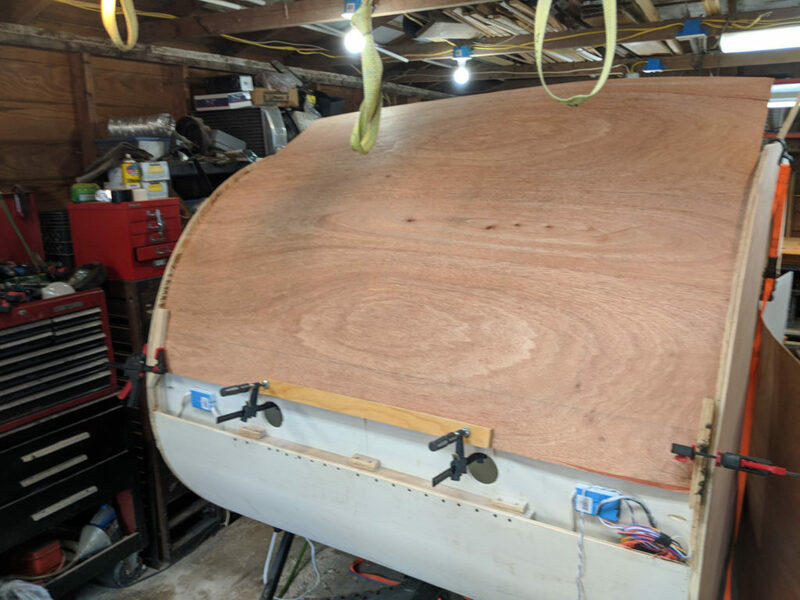 With a little strap clamping and some cross boards I glued the insulation in place. Originally I had planned to break this span up with cross members. 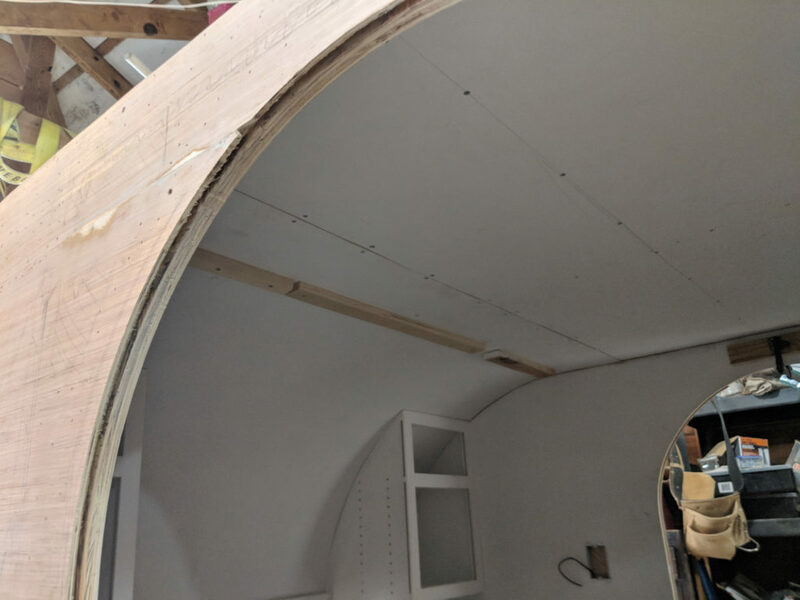 After a little testing I realized that gluing the insulation to the interior ceiling and exterior roof would result in a super rigid and strong curve that was lighter and probably stronger than using cross members but leaving the foam floating unglued. 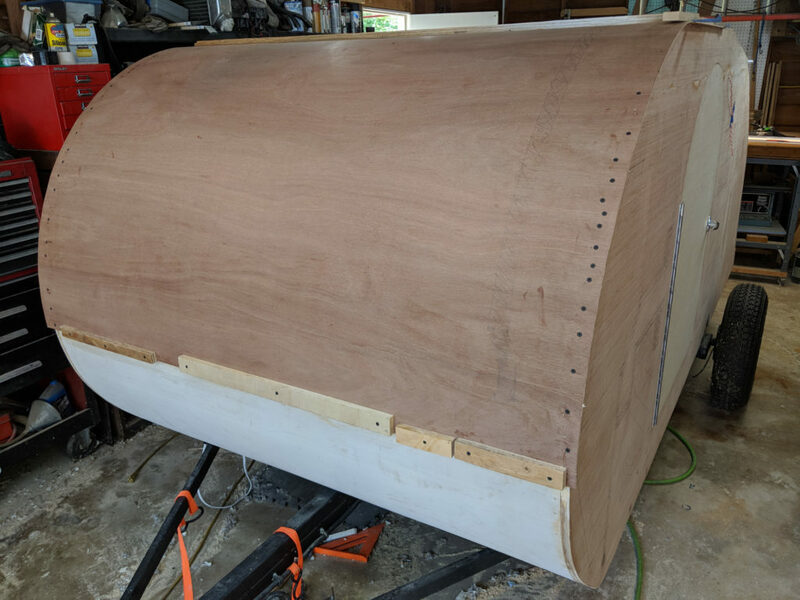 If I ever build version 2.0, I will create more glued insulation-plywood composite panels. They are surprisingly strong. I shouldn’t be surprised since they are used in “real” construction now too. Not shown is the boring process of cutting the squares of insulation for the rest of the roof. These are mostly just flat sheets. 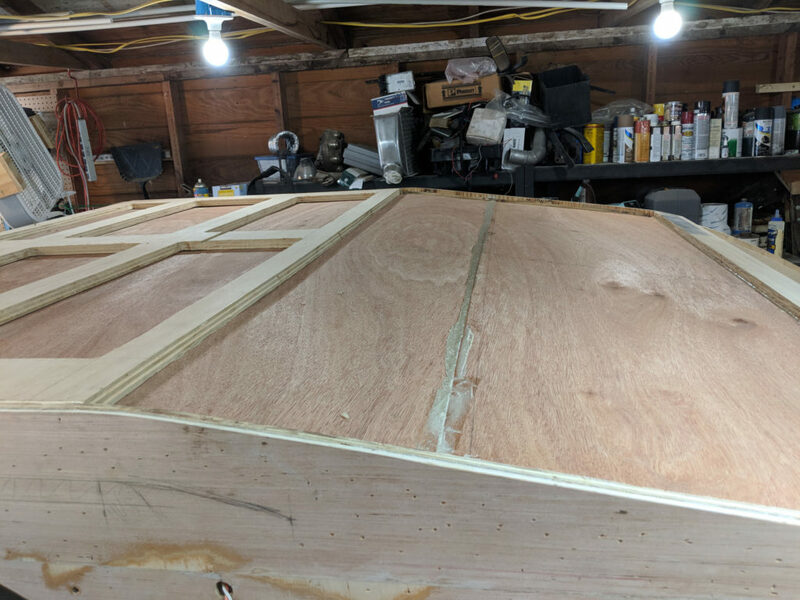 I glued the rear sheet to stiffen the large flat expanses of unsupported 1/8″ ceiling. I did not glue the insulation in the flat top support. The roof there was plenty stuff. I previously (months ago) made the door blanks. The process was tedious. 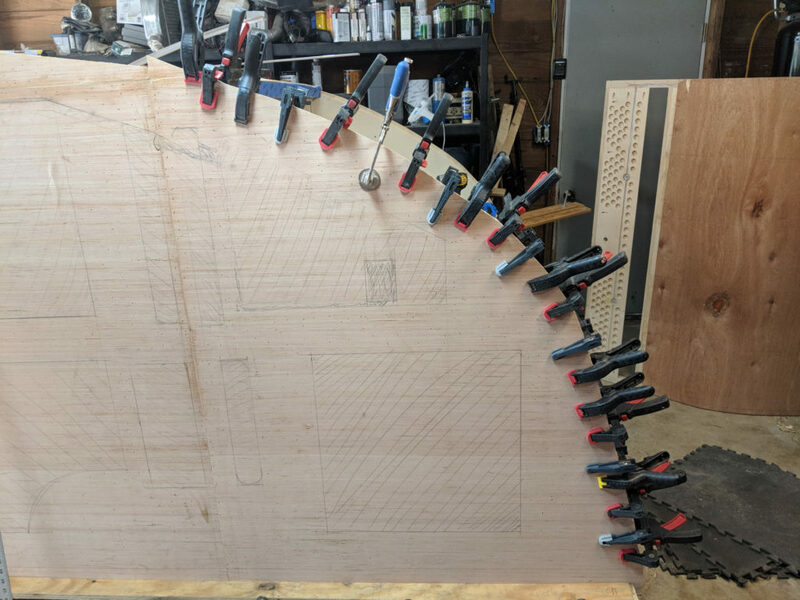 I started with the cut outs which where the right shape but an inch smaller than required thanks to the 1/2″ router bit used to remove them from the wall… Using collars I could enlarge the template about 1/4″ per cut and the doors needed to be about 1/2″ oversized to allow for the seal that will eventually live in them. 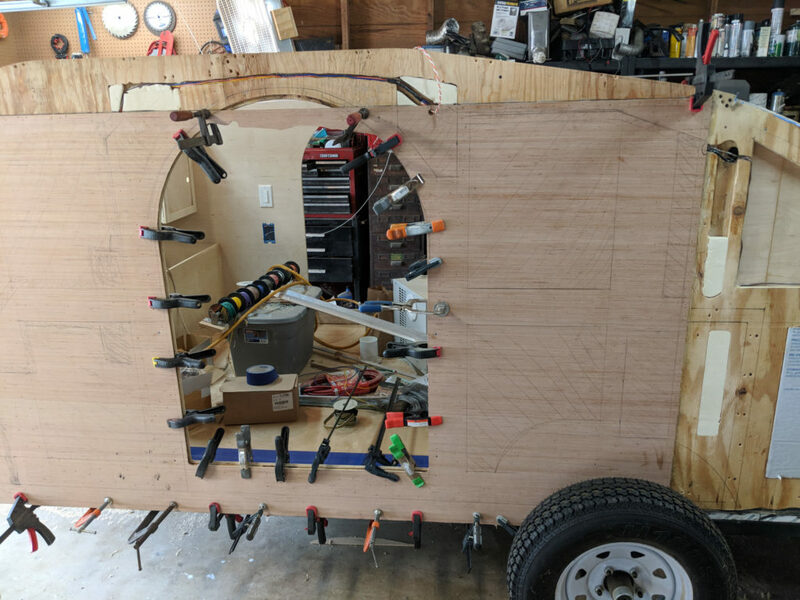 All of that means I got to cut 4 templates to grow from the original cut out to a workable door template I could use on the expensive void-less plywood I used for the doors. The doors needed to be 1 1/4′ thick to match the rest of the wall. One 3/4″ inch piece and one 1/2″ piece gets you just about exactly there. As of now the doors are solid plywood and very heavy. Eventually I’ll either mill out some voids and add pockets and windows or I will remake the doors with voids built in internally. 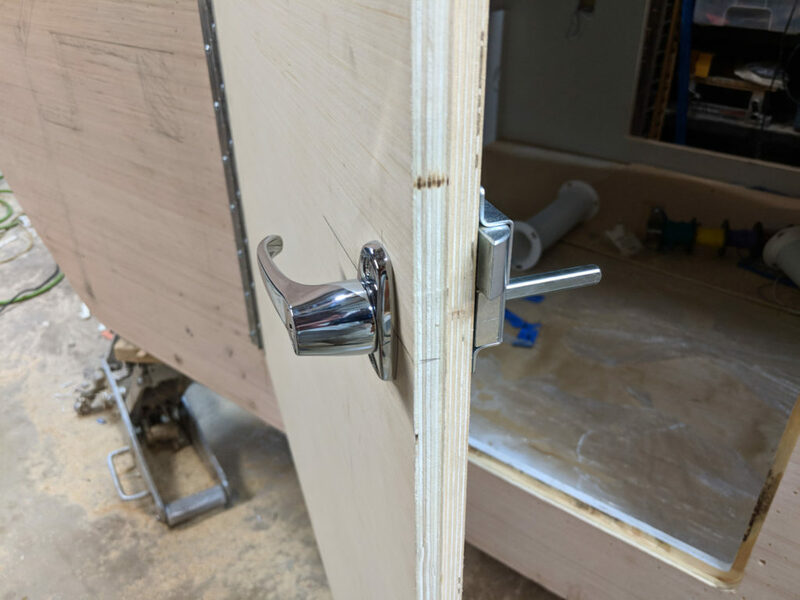 With the doors already made all I had to do was properly size the rabbet in the edge of the doors and the walls to match, place the hardware and then install. It wasn’t fast (it is DEFINITELY a measure 4 times, cut once operation), but it also wasn’t hard. The doors are not weather tight yet, nor are they fit perfectly. 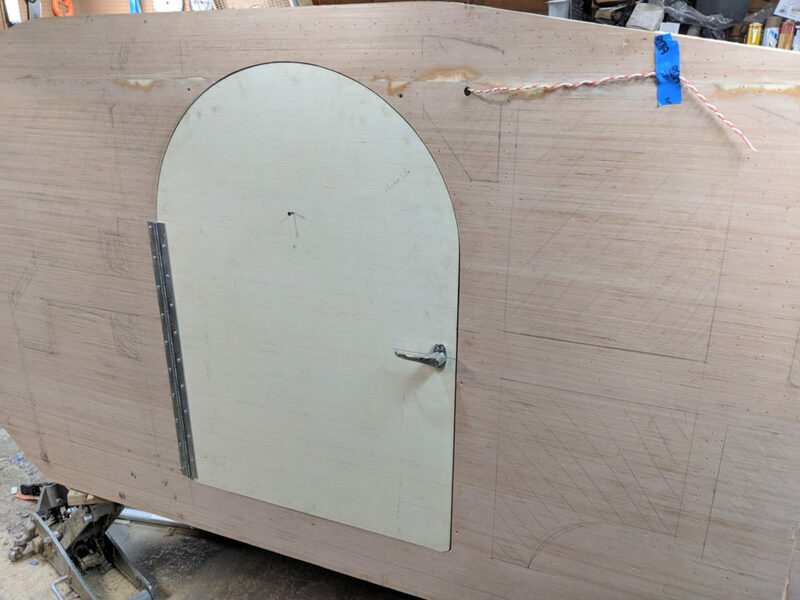 A project for a future day is to tune the fit, sand and seal the edges of the plywood on both the doors and wall and then apply the seals. And now it is is go time for one of the major steps: installing the roof. But, I’m getting ahead of myself. Before I installed the roof, I had to wire the interior ceiling lights. I notched the insulation to create a wiring chase and ran everything. The lights are installed, but can be removed from inside to paint. With that done, I applied the roof. Again, I’m using 1/8″ plywood and construction adhesive. This is an underlayment so it doesn’t have to say pretty. It does have to be structurally sound. Pulling the roof tight against the curve of the wall proved to be hard, especially since brad nails pull right through. The strategy I ended up using was to drive short drywall screws in every inch or so. Once the construction adhesive dried I removed them. I sealed the holes with more constructions adhesive and also touched up any sections where the roof might not have adhered completely. This has been a long post, but it covered a lot of ground. 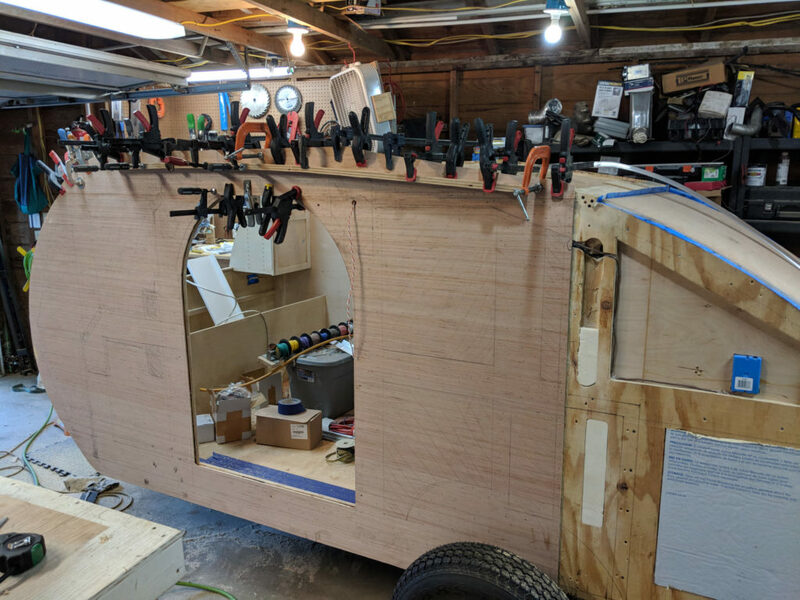 The trailer is almost ready to roll. I need to install trailer lights and finish the rear hatch. 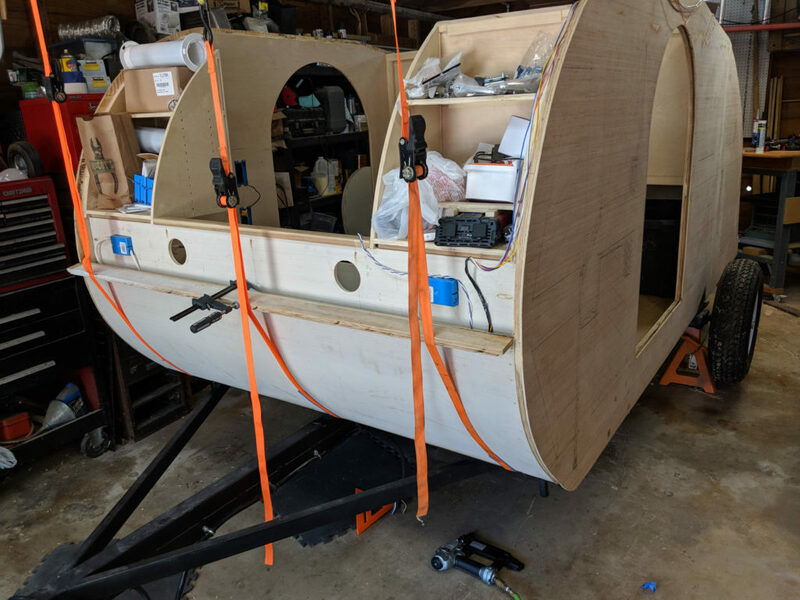 There is still a ton of other stuff to do before it goes camping the first time, but at least it will be road legal and somewhat secure, if not weather-tight.